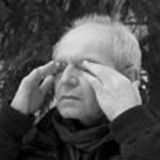 Milos Sejn works in the fields of visual art, performance and study of visual perception, and conducts workshops, such as Bohemiae Rosa. Sejn’s artistic vision formed when he was young and when he undertook many trips into the wilderness. It embodied an inner need to get closer to the secret of nature and observe the miracles that happen in it. From the beginning of the 1960s he took pictures, drew, collected and described his observations of nature during these wanderings. Sejn’s present-day interest is in the relationship of nature and art as intrinsic needs of the mind, and focuses on immediate creative possibilities, based upon relations between historical humanized landscapes and intact nature. He consciously works in the areas of expressive language among text, visual stroke, body movement, voice, and expansion into space.